The LEAP program was the best investment I could have made. After four months, my symptoms have completely resolved. 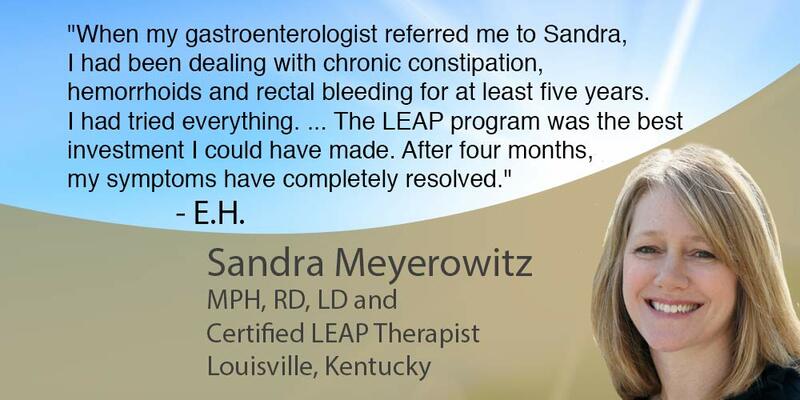 - Oxford Biomedical Technologies, Inc.
“When my gastroenterologist referred me to Sandra, I had been dealing with chronic constipation, hemorrhoids and rectal bleeding for at least five years. I had tried everything — multiple medical tests, two colorectal surgeries with painful recovery, prescription medication and eating healthy, high-fiber foods — to no avail. The LEAP program was the best investment I could have made. After four months, my symptoms have completely resolved. The LEAP program’s specific, detailed instructions suited my personality well. It has been HARD work, but completely worth it. The LEAP program opened my eyes to the great variety of proteins, grains, vegetables, fruits and nuts I COULD eat.